If you are applying for an Iraq passport or visa, and are in need of an Iraq passport photo or visa photo, then Reload Internet is the best studio to visit. 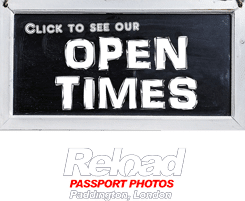 We are based in Paddington, London, and have been in operation for over a decade, producing hundreds of passport and visa photographs every week! Our staff have been trained to provide you with a set of high-quality Iraq passport and visa photos, that meet all of the necessary criteria and come with a guarantee to pass the first time you submit them with your application to the Iraq Embassy. No appointment is needed to have your Iraq passport photo or visa photo capture, printed and prepared by us. Just stop by our store, and a member of our experienced team will be happy to help you. We stay open every day of the week, from early in the morning until late into the evening, so you can come and have your photographs produced at a time that suits you. We even stay open until 8pm on Sundays! We aim to have all of our customers passport and visa photographs ready within 10 minutes of their arrival at our studio. Your Iraq passport photo or visa photo must meet all of the specifications listed below, otherwise it will probably be rejected by the Embassy when you submit it with your application. 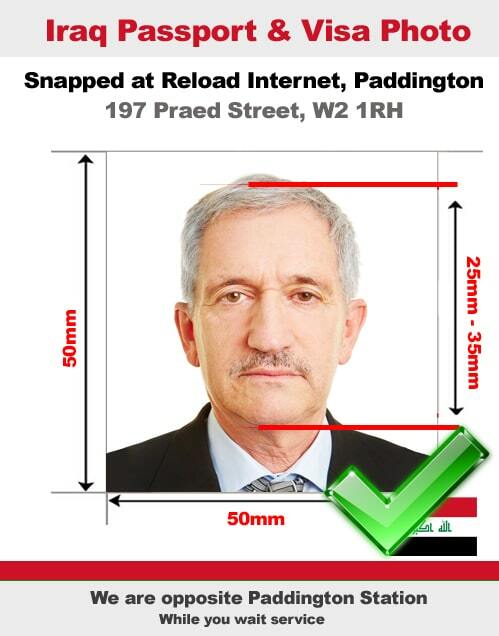 Reload Internet can guarantee that the Iraq passport photo or visa photo we provide you with will pass first time! The photo should be 2” X 2” in dimensions and you should submit three copies of the same photo. In the photo, your face should be seen clearly along with the top of your shoulder. Almost 60% – 70% of the photo should comprise of your face and the size of your face should be 1” X 1 3/8” measuring from the tip of your head to the chin. All your facial features must be seen clearly in the photo that is oriented straight and the left and right sides of your face must be seen clearly, with the visibility being same on both the sides. If you have long hair, ensure that it does not cover your head in any manner and the hair should be done neatly so that it does not cover the face. The photo should not be older than six months and your face should resemble how you are looking presently. Do not pose and give a natural expression. While posing for the photo, do not smile or show your teeth. The eyes should be open and do not raise you eyebrows or frown, as it might not be accepted. The photo should be printed on high-quality photo paper with a print resolution of over 600 dpi and there should not be any changes in the color or any touch-ups done to the photo to soften lines or highlight features. Print the photos on an as-is basis in color. Do not wear any glasses while posing for the photo. Even if you necessarily have to wear glasses, you will have to make sure that there is no glare and your eyes are clearly visible. There should not be any shadows or reflections due to the glasses on your eyes. Wearing head gear is not recommended. However, if you have to wear a head gear owing to religious reasons, you will have to make sure that your face is clearly visible from the chin up to the forehead without any obstructions. You should look into the camera with the eyes in the direction of camera and a straight vision. The photos must be clicked against a light background and there must not be any pattern. The lighting for your photo should be perfect and it should not result in any shadows at any place in the photo. If you are planning to get a passport for an infant or child who are not in a position to support themselves, you will have to support the baby in a manner such that your hands or support are not visible. Also, the eyes of the child must be visible clearly in the photo. Our specification are taken from the Iraqi Embassy’s guidelines on passport and visa photographs, which you can see here.